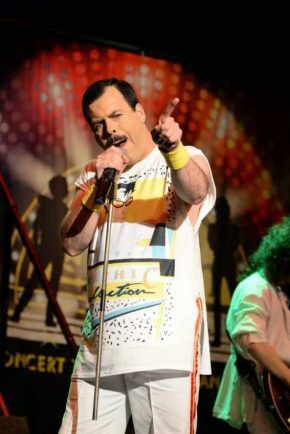 SCOTT Maley’s been playing Freddie Mercury for 22 years and he admits that when he’s on stage and all those great Queen hits are pumping out, his alter ego takes on a life of its own. “I was a fan anyway when I first started but when you take on the role and you watch as much as you can of Freddie it just becomes natural and you start to embody what you are doing,” he said. “Queen were such a phenomenal band – the chemistry of them all, they had the full spectrum, the performance, the live shows, the songs, the albums – it’s all pure magic and something that only comes round once in a blue moon. Scott had grown up with Elvis and The Beatles in his Walsall home but says Queen always seemed to be prominent there too. He joined a covers band, and inevitably that led to them doing Queen numbers until in 1995 they launched themselves as tribute band ‘Killer Queen’. “I’ve been playing the role of Freddie ever since,” says Scott. “We started out small but them started getting invited to bigger events and festivals and it’s snowballed ever since. “The shows take on a life of their own, the audiences know all the songs and because one huge party, a celebration. Fans will have a chance to judge for themselves when his band, now known as Supreme Queen, play the Palace Theatre on Saturday, September 16. “We base everything on the Queen Live concerts. Queen is pure theatre and It’s spectacular, it’s in your face and it’s rock orientated. Joining Scott on stage will be Luke Timmons on guitar, Ben Marshall on keyboards, Simon Chisholm on Drums and Chris Malin on bass. Tickets are £20 from the box office in person, on 01527 65203 or online at http://www.redditchpalacetheatre.co.uk/ .